Home » MORPHO-ANATOMICAL AND PHYSICOCHEMICAL EVALUATION OF GARCINIA PEDUNCULATA ROXB. EX. BUCH.-HAM. 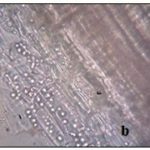 MORPHO-ANATOMICAL AND PHYSICOCHEMICAL EVALUATION OF GARCINIA PEDUNCULATA ROXB. EX. BUCH.-HAM. University Institute of Pharmacy 1, Chhatrapati Shahu Ji Maharaj University, Kanpur - 208024, Uttar Pradesh, India. The Energy and Resources Institute (TERI) 2, Northeastern Regional Centre, Guwahati - 781036, Assam, India. ABSTRACT: Garcinia pedunculata Roxb. ex. Buch.-Ham. (Family: Clusiaceae), is an evergreen potent medicinal plant with fluted trunk commonly known as Amlavethasa. It is used by various ethnic communities of North-East India to treat various ailments such as asthma, cough, jaundice, fever, dysentry and as a cardiotonic. The plant is considered to be containing much medicinal value and mature fruit and tender leaves are also eaten raw and as vegetables by the local people. Plant has not been explored scientifically for its pharmacognostical details. Therefore, the study of morpho-anatomical characters, physicochemical analysis of G. pedunculata was under taken to establish the pharmacognostic and phytochemical details about the plant. 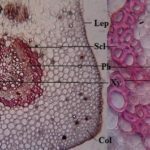 Macro and microscopical studies of leaf showed the presence of simple, petiolate leaf generally obovate oblong, some elliptic and oblong in shape with obtuse and sub-acute tip and paracytic stomata. Bicollateral vascular bundle covered with sclerenchymatous fibres in leaf and 8-10 layer of collenchyma, scattered pericyclic fiber, arrangement of phloem in the ring form in stem are some diagnostic features noted from anatomical study of the plant. Powder microscopy revealed the presence of palisade parenchyma with epidermis, parenchyma fibers and scalariform vessels. HPTLC finger printing of plant tried with solvent system chloroform and methanol (8:2) confirmed the presence of 09 spots with different Rf value under UV light 366λ. Phytochemical evaluation revealed the presence of carbohydrate, glycoside, saponins and phenolic compound. INTRODUCTION: Garcinia pedunculata Roxb. ex. Buch.-Ham (family: Clusiaceae) commonly known as “Amlavethasa” in India and “Taikor” in Bangladesh, is an evergreen tree with fluted trunk and short spreading branches. It is available particularly in Assam, Arunachal Pradesh and West Bengal regions of India. Traditionally, the plant has been used for many ailments such as chronic catarrh, asthma, cough, bronchitis, fever, dysentery and as a cardiotonic 1, 2. The fruits of plant has been using by the people of Assam as medicine to treat different types of stomach related diseases 3. The pericarps of the fruits are extensively used in diet across the North Eastern states of India. Fruits are also used as a garnish for curry and in some of the folklore medicine in India and contain 2 - 3% garcinol 4. The plant is reported to possess various biological activities like antioxidant 5, anti-inflammatory 6, cardioprotective 7, hepatoprotective 8 and anti-diabetic activity 9. The phytochemical studies have shown the dried fruit rinds and pericarp of G. pedunculata contains benzophenones, pedenculol, garcinol and cambogin 10. However, available literature revealed that no detailed anatomical and physicochemical studies have been carried out on G. pedunculata; hence the present investigation was under taken. The object of present study is to evaluate pharmacognostical and physicochemical parameters of G. pedunculata; which will assist in standardization and it can also be used to prepare a monograph for the proper identification of plant. Plant Material: Garcinia pedunculata plants were collected from homestead garden of Bamfar village, Kamrup (M) District, Assam, India in the month of April 2017. 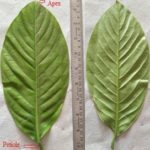 The specimen was identified by Taxonomist, TERI - Northeastern Regional Centre, Guwahati and later specimen was confirmed in BSI, Shillong and voucher specimen was deposited in herbarium section of TERI -Guwahati for future reference. Morpho-anatomical Evaluation: Fresh plant of Garcinia pedunculata Fig. 1 was taken for morphological and anatomical study. Various organoleptic and morphological characters of G. pedunculata leaves like colour, shape, size, apex, margin etc. were studied. For the anatomical studies, free hand transverse sections (T. S.) of the leaves, petiole and stem were prepared using razor blade. Lignified, cellulosic and other identifying features were studied by staining the sections with 0.1% w/v phloroglucinol followed by concentrated hydrochloric acid 11, 12. The stained sections were observed under microscope. Photomicrographs of all the sections in different magnifications were taken with Olympus digital microscope assisted with 1/3” CCD sony camera. Physicochemical Analysis: In this study, shade dried plant material was used for quantitative determination of physicochemical parameters such as foreign matter, loss on drying, total ash, acid insoluble ash, water soluble ash, extractive values were determined according to the well established official method and recommended procedures 13, 14. Powder Microscopy: The dried aerial part of G. pedunculata was powdered and studied under the microscope. The powder was macerated in chloral hydrate reagent. The macerated powder was then stained with phloroglucinol, iodine reagents separately. Small quantities of the various stained powders were mounted on a slide with glycerin and examined under microscope 14. Photomicrographs of the different cellular structures and inclusions were taken. Preliminary Phytochemical Screening: Pre-liminary screenings of methanol extract of Garcinia pedunculata were carried out using the standard procedure 14. Fluorescence Analysis: Fluorescence study of leaf and fruit powder was performed as per reported standard procedure 15. A small quantity of the each powder was placed on a grease free clean microscopic slide and 1-2 drops of the freshly prepared reagent solution were added, mixed by gentle tilting the slide and waited for 1-2 min. Then the slide was placed inside the UV chamber and observed in visible light, short ultraviolet radiations. The colors observed by application of different reagents in different radiations were recorded. HPTLC Profile: For proper meaningful utilization it is important to have quality standards of materials and for this quality standardization high performance thin layer chromatography (HPTLC) finger print profile of methanolic extract of G. Pedunculata (10 µl of 1 mg/ml) was developed. The HPTLC analysis was carried out on percoated Silica gel on 60-F254 plate (Merck, India) with the help of Camag Linomat -IV applicator. The plate was eluted with chloroform: methanol (80:20) as mobile phase. After development, the plate was dried and densitometrically scanned on a TLC scanner III at 366 nm using Wincat software (CAMAG, Switzerland) and peak area was recorded. 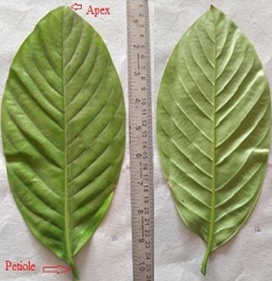 Macroscopic Characters: Macroscopically, the fresh leaf of G. pedunculata is 20 to 23.5 cm long, 9.5 to 12.5 cm width and petiole 1.8 to 2.6 cm long, some variation occur in shape of leaf i.e. generally obovate, some elliptic and oblong in shape with obtuse and sub-acute leaf tip, cuneate at base and green in colour. Midrib stout, prominent and lateral veins are distinct Fig. 1. Fruit is globose, yellow in colour when ripe and 4 - 8 seeded Fig. 2. 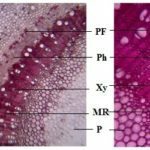 Leaf Microscopy: Transverse section (T.S.) of leaf passing through midrib region shows dorsiventral in shape. Upper surface of the leaf consist of rounded to ploygonal thin walled two celled epidermis covered with thin cuticle without any trichomes. Lower epidermis is single celled but the cells are more spherical compared to upper epidermis. Mesophyll composed of palisade and spongy parenchyma. Single layered palisade cells are small, elongated and compact in laminar region followed by several layer of spongy parenchyma. Numerous secretary cells and few vascular strands are seen. Collenchyma appears below upper epidermis and above lower epidermis. Midrib region show large bicollateral vascular bundle arranged in fetal shaped covered with patches of sclerenchymatous fibres. Xylem is surrounded by phloem and consists of vessels, tracheids, fibers and xylem parenchyma Fig. 3. Lower leaf surface of G. lanceifolia shows paracytic stomata Fig. 4a, while stomata absent in upper leaf surface. 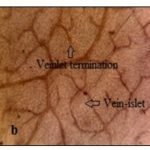 Leaf surface also show the presence of veins, vein islets, vein terminations Fig. 4b and palisade cell Fig. 4c. Leaf constant such as stomata number, stomatal index, vein islets number, vein termination number were measured. The results are shown in Table 1. Petiole Microscopy: T.S. of petiole is somewhat circular in shape; single layered epidermal cells covered with thick cuticle; ground tissue collenchymatous. Vascular tissue is arranged in continuous ring form in the center of petiole. Group of pericyclic fibres are seen in vascular bundle region. Vascular bundle composed of metaxylem, protoxylem and phloem Fig. 5. Stem Microscopy: T.S. of stem is almost circular in outline. Single layered and thin walled epidermis covered with thin cuticle; hypodermis collen-chymatous followed by 8-10 layer of collen-chymas; cortex parenchymatous and pericyclic fibres are present in scattered form. Phloem well developed in the form of ring and consist of sieve tubes, companion cells and phloem parenchyma. Xylem is present in form continuous ring and consists of vessels, tracheids, fibers and xylem parenchyma; vessels are in radial rows. Medullary rays are distinct; centre portion occupied by collenchymatous pith. The secretary cells are concentrated below the collenchymas Fig. 6. 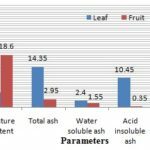 Physicochemical Parameter: The results of physicochemical parameters of leaf and fruit such as foreign matter, moisture content, ash values and extractive values are presented in Fig. 7. Powder Microscopic Characters: The powder plant material is greenish in color; showing fragments of palisade and spongy parenchyma with epidermis Fig. 8a parenchyma fibers Fig. 8b vessels having scalariform thickening Fig. 8c. Preliminary Phytochemical Screening: Pre-liminary phytochemical screening mainly revealed the presence of carbohydrate, glycoside, saponins, phenolic compound and fixed oil and fat. Fluorescence Analysis: The fluorescence characteristics of the leaf and fruit powder with different chemical reagents are summarized in Table 2. HPTLC Profile: A densitometric HPTLC analysis was performed for the development of specific finger print profile which may be used as marker for quality evaluation and standardization of the drug. The preliminary HPTLC studies revealed that the solvent system chloroform: methanol (8:2) was ideal for the alcoholic extract and gave well resolved peaks of crude extract of G. lanceifolia Fig. 9. DISCUSSION: Proper identification plant species is a major concern for users and industry for reasons of safety and efficacy. Therefore, authentication of medicinal plants is of utmost importance. Morphological, anatomical, physico-chemical and chromatographic finger printing solves the problem by differentiating the genuine material from the adulterants, substitutes and spurious drugs. Therefore, present study reports the morpho-anatomical characters, physiochemical and chromatographic profile of G. xanthochymus. 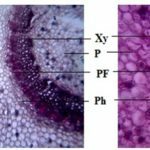 The presence of paracytic stomata, secretary cells, arrangement of bicollateral vascular bundle in fetal shape in leaf and presence of xylem and phloem in form of ring in stem are the some of the diagnostic features noted from anatomical study of plant. Ash values and extractive values can be used as reliable aid for detecting adulteration. These studies help in identification of the plant materials. Extractive values are useful to evaluate the chemical constituents present in the crude drug and also help in estimation of specific constituents soluble in particular solvents 16, 17. The extractive values obtained revealed that majority of the chemical constituents were water-soluble not alcohol soluble. The moisture content of a drug should be minimized to prevent decomposition of crude drugs either due to chemical change or microbial contamination 18. The result of moisture content indicates the presence of appre­ciable quantity of water in G. pedunculata fruit. Preliminary phytochemical analysis indicated presence of glycoside, saponins, phenolic compound, fixed oil and fat. The fluorescent analysis under day light and UV light by treatment with different chemical reagents showed different colour. This analysis suggests that, leaves and fruit extract of G. pedunculata probably contain active agent(s) and this provides the basis for their folkloric use as a cure for some human ailments. 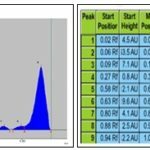 HPTLC fingerprint profile along with their Rf values were recorded, which would serve as a reference standard for the scientist engaged in research on the medicinal properties of plant. CONCLUSION: In conclusion, the data generated from this study would help in development of pharmacopoeial standards and prevent adulteration G. pedunculata leaves and fruit. Further, this investigation will provide valuable information to the researchers to establish the pharmacological activities supported with possible mode of action. ACKNOWLEDGEMENT: The authors wish to acknowledge the financial support provided by the Department of Biotechnology, Government of India (Grant sanction number BT/PR16665/NER/ 95/236/2015). CONFLICT OF INTEREST: The authors declare that they have no conflicts of interest. Kagyung R, Gajurel PR, Rethy P and Singh B: Ethnomedicinal plants used for gastrointestinal diseases by Adi tribes of Dehang-Debang Biosphere Reserve in Arunachal Pradesh. Indian J. Trad Know 2010; 9: 496-501. Baruah S and Borthakur SK: Studies on morphology and ethnobotany of six species of Garcinia (Clusiaceae) found in the Brahmaputra Valley, Assam, India. J Nat Prod Plant Resour 2012; 2: 389-396. 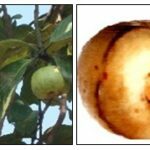 Sharma R and Devi R: Ethnopharmacological survey of Garcinia pedunculata Fruits six different districts of Assam, India. Int J Pharm Sci Invent 2015; 4: 20-28. Krishnamurthy N, Lewis YS and Ravindranath B: On the structures of garcinol, isogarcinol and camboginol. Tetrahedron Lett 1981; 22: 793-796. Mudoi T, Deka DC and Devi R: In-vitro antioxidant activity of Garcinia pedunculata, an indigenous fruit of North Eastern (NE) region of India. Int J Pharmtech Res 2012; 4: 334-42. Mundugaru R, Joy F, Shrinidhi R, Das L and Ravishankar B: Anti-inflammatory activity of aqueous extract of fruits of Garcinia pedunculata in experimental animals. Am J Pharma Tech Res 2014; 4: 3-6. Ravi M, Senthil KS, Padmaja UK and Sudhakara B: Cardio protective activity of fruits extract of Garcinia pedunculata. Bangladesh J Pharmacol 2016; 11: 5-9. Mundugaru R, Varadharajan MC and Basavaiah R: Hepatoprotective activity of fruit extract of Garcinia pedunculata. Bangladesh J Pharmacol 2017; 12: 483-487. Ali M, Paul S, Tanvir EM, Hossen M, Rumpa NEN and Saha M: Antihyperglycemic, antidiabetic, and antioxidant effects of Garcinia pedunculata in rats. J. Evid Based Complementary Altern Med 2017; 17: 1-15. Sahu A, Das B, and Chatterjee A: Polyisoprenylated benzophenones from pedunculata. Phytochemistry 1989; 28: 1233-1235. Kokate CK: Practical Pharmacognosy. Vallabh Prakashan, Delhi, India, Edition 4th, 1994. Gupta PC and Rao CV: Morpho-anatomical and physicochemical studies of Fumaria indica (Hausskn.) Pugsley. Asian Pac J Trop Biomed 2012; 2: 830-834. Khandelwal KR: Practical Pharmacognosy. Nirali Prakashan, Pune, India, Edition 16th, 2006. Pratt RJ and Chase CR: Fluorescence of powdered vegetable drug with particular reference to development of a system of identification. J Am Pharm Assoc 1949; 38: 324-333. Kumar SV, Sanghai DB, Rao CM and Shreedhara CS: Histological and physiochemical standardization of Melia azedarach bark. Asian Pac J Trop Biomed 2012; S2: 84-89. Gupta PC, Sharma N and Rao CV: Pharmacognostic studies of the leaves and stem of Careya arborea Asian Pac J Trop Biomed 2012; 2: 404-408. Sanmuga PE and Venkataraman SP: Pharmacognostical and phytochemical studies of Strychnos potatorum seeds. Pharmacog J 2010; 2: 190-197. Gupta PC, Kar A, Sharma N, Sethi N, Saharia D and Goswami NK: Morpho-anatomical and physicochemical evaluation of Garcinia pedunculata Roxb. ex. Buch.-Ham. Int J Pharmacognosy 2018; 5(9): 630-36. doi link: http://dx.doi.org/10.13040/IJPSR.0975-8232.IJP. 5(9).630-36. Authors Address: University Institute of Pharmacy, Chhatrapati Shahu Ji Maharaj University, Kanpur, Uttar Pradesh, India.